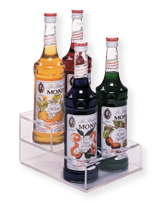 This bottle organizer can display up to four bottles of your customer's favorite sauces. It has two tiers so that each bottle is easily seen. This Bottle Organizer offers a Successful way to display your products. Constructed of clear Acrylic, this Countertop Food Service Dispenser is a great value. Buy Bottle Organizer now - Use our convenient shopping cart or give us a call and place your order with a knowledgeable service representative today!